We like to view higher education as the “great equalizer” that leads to social mobility. But selective colleges have long been accused of perpetuating class divides, rather than blurring them. A recent landmark study by Stanford’s Caroline Hoxby and Harvard’s Christopher Avery lent further empirical evidence to this accusation, finding that high-achieving low-income students do not have access to selective schools. The study showed that the mismatch is due to a lack of knowledge, not quality. Low-income students outside of major urban centers do not even apply to the top-tier colleges for which they are qualified. Yet while the information gaps are real and need to be addressed, there is a much deeper structural problem. If most top colleges wanted to be truly equitable, they could not be with their current business model. There is not a golden pot of low-income applicants that schools want but are failing to reach. Instead, many schools don’t want more low-income students because they won’t be able to pay for them without a major overhaul of school funding practices. Outside of the handful of super-elite universities with fortress endowments, colleges’ finances are currently designed around enrolling a disproportionately high number of high-income students. These schools could not afford to support more low-income or middle-income students absent either a huge increase in tuition, a commensurate reduction in spending, or a dramatic change in public funding. In fact, schools are already moving away from a more equitable system. Colleges actively recruit “full pay” students who can attend and will not need financial aid. A 2011 survey by Inside Higher Ed found that about 35 percent of admissions directors at 4-year institutions, particularly public colleges, had increased their efforts to target “full pay” students. Far from wanting to enroll more low-income students, colleges recruit more affluent ones who will pay full price to attend. A follow-up survey of college business officers found that the most common strategy to deal with financial challenges in the next few years was to “raise net tuition revenue.” More than 7 in 10 college CFOs cited this answer. In other words, schools are becoming more reliant on the inequality in the system than ever before. It’s not that the elite colleges are admitting dumb rich kids. It’s just that there are more smart kids applying for the best schools than there are openings and the ones with the ability to pay their own way are getting selected. Given a choice between a rich kid in the 98th percentile and a poor kid in the 99th percentile, they’d rather have the former. Freedman is talking about elite private schools like Stanford and George Washington, with annual tuition of over $50,000. And, Freedman contends, they actually need to not only charge but get that much to stay in business. If GW’s demographic profile matched the actual distribution of high-achieving students – that is, if there were one bottom-quartile student for every two top-quartile students — GW’s revenue would plummet by about 20 percent. The school would have to raise its tuition for students that are paying full price. But there would be far fewer of them. To take in the same amount of money as they currently do, GW would have to raise its price by approximately $30,000 per full-pay student, for a sticker price of about $90,000 a year. The actual increase would likely need to be more, given that families making $120,000 per year are classified as high income but cannot afford a college cost that would consume three-fourths of their annual income. Basically, then, the only schools that can afford to take in a lot of poor students and supply them with financial aid are the handful with huge endowments. But, while most of our most prestigious schools are private, there are many top tier public institutions as well. Surely, given that they operate in the public interest, they can absorb the most promising poor students and set them on the path to breaking the cycle of poverty? Well, not so much. In fact, the problem is even worse at public universities. In short, we really don’t have public universities in the sense that we had even when I was going to school in the late 1980s any more. The University of Virginia, the flagship public institution of the state in which I live, charges $11,794 in tuition and fees for in-state undergraduate students for the 2011-12 academic year (why they haven’t updated their website since then, I don’t know). That’s a bargain compared to GW. Then again, when you add in books and supplies, room, board, and “personal expenses,” the cost more than doubles to $23,984. Costs are similar at William & Mary, the state’s outstanding public liberal arts college, and a smidgen cheaper at Virginia Tech, the state’s outstanding engineering school. Even at these high prices, they’re a bargain compared to the Ivies and other elite private schools. For out-of-state students, UVA’s tuition is $36,788 and the full cost is $48,988. So, a huge subsidy by the taxpayer. Still, the prices are not exactly within the reach of non-affluent parents without substantial financial aid or crippling loans. And, again, this is a relatively recent trend. When I transferred to Jacksonville State in 1986, full-time in-state undergraduate tuition was $400 per semester for all the credits you could handle. Inflation alone would have merely doubled the prices; $400 in 1986 is $848.65 in 2013 dollars. That’s part-time job money. Now, it’s $283 per credit hour. I took very heavy loads, but let’s say you’re only taking the traditional 16 hours. That’s $4528 a semester and $9056 a year just for tuition for the two main semesters. At a very non-elite institution. Indeed, the only leveling that the public institutions are doing these days is that it costs pretty much the same thing to attend the very best state schools as it does the no-prestige regional teaching colleges. When I started at Lawrence Tech University, a small, private architecture and engineering school in suburban Detroit, back in 1984, I paid about $1200 per semester for a relatively light class load (nine semester hours). No room and board–I lived at home. And even that was quite a lot, so I ended up leaving school to join the Air Force for the GI Bill. All those buildings and private-planes traveling and visiting professor programs have to be paid for by somebody. Seriously, any low level employee in a higher-ed accounting department can explain the cost problems in a heartbeat. They spend money like a Kardashian in a shoe store. One of the great unmentioned reasons for recruiting rich kids is that they will have good careers despite their grades, major, or what they did in college. A recent book has come out about how universities cater to rich students who major in easy subjects and how those students can become distractions for the poor, blue collar students who are around them. The cost of college has skyrocketed over the past few decades, well in excess of the inflation rate. There are scads of reasons — bureaucratic bloat is a big one, as the number of various and sundry administrators with ever-lengthier titles — but here’s an area where a federal investigation just might be justified. I’m a retired academic from one of the best public universities. The tuition is astronomical. From what I can gather, part of the reason is the strong desire of the university to compete in the big leagues for faculty and students, and part because state allocations cover only a small fraction of the university’s operating expenses, far less than when I started my academic career in the mid 60’s. The mean family income of our undergraduates was over $100,000 when I retired in 2003. What it is now, God only knows. The tuition at my elite alma mater has been tripling roughly every ten years. In 1959 annual tuition was $600. By the early 1970s it was $1,800. Now it’s just under $50,000 per year. There’s another complicating factor. When I attended college with a combination of scholarships, loans, working, essentially, full-time while attending college, and working full-time in the summers, I was able to put myself through. It’s a lot harder for kids to get paying jobs (especially jobs with decent pay). The sports programs alone spend millions at my local state college. At a minimum they have private planes, cars, tuition and free housing for football and basketball players. They also spend thousands of dollars on catering and facilities “upgrades” each year. It is also not uncommon for most professors to take off for the entire summer on fully paid trips to Europe, Africa, Asia, etc. with their families at public expense. I’m sure some good academic work is done, but there is no need for a cost-benefit analysis because the market will always have enough students willing to pay. The system is horribly broken and people are taking advantage. There are clear problems with bureaucratic bloat and competition between schools by building nicer and nicer facilities. These are real problems, to be sure. However, perhaps the most significant driver of the problem at state schools is ongoing, and significant, decreased in state funding for ostensibly state schools. When schools get less, often quite a bit less, than 20% of their funding from the state, they have to get the money from somewhere, and that somewhere is tuition and fees. It’s not that the elite colleges are admitting dumb rich kids. On the 1-10 Scale of Obviousness this article rates a 14. My oldest daughter attends the state flagship school and tuition went up $2,000 for the next academic school year. They have had cuts at the state level but built a fancy, state of the art business school that the students get to pay for with the tuition increases. My younger daughter is attending Northeastern in the fall because they offered a full tuition scholarship and the engineering department offered 6,000 more. The school is almost 60k per year but because of the scholarships it is cheaper to attend there than the state university my oldest attends. If not for the scholarship there is no way our family could afford to send my daughter to NU, but from friends she has made online it is pretty clear most of them can afford to pay the tuition. College is ridiculously expensive and without some financial help there is no way lower income or even more so low middle class (people who don’t qualify for much in grants but don’t have thousands a ails me for tuition) can’t afford elite or at least selective colleges. Private planes? I suppose some of the elite of the elites may have private planes, but this is hardly common on at the heart of cost issues. Visiting professor programs? How is this a) a massive cost, or b) some sort of widespread “problem”? The spending on sports facilities can be maddening,. The truth of the matter it, however, that most that money is raised privately. Alumni love to contribute to new arenas. Libraries? Not so much. Actually, it is quite uncommon for this to happen. Further, most faculty are on 10-month contracts, and therefore not paid for the summer months. Where are you getting this stuff from? Oh come off it Steve! Do you really mean to say that all those budget cuts have consequences? Everyone KNOWS that lower taxes means more revenue! What world do you live in???? Wait a minute…. The Real one? I think one issue with sports programs is that outside of a few programs at a few schools sports in general can be and often are money losers for colleges. 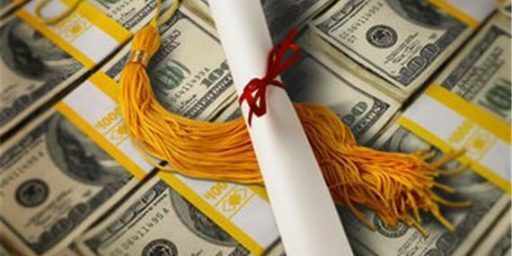 Many state schools offer athletic scholarships while cutting back on the number and/or award amounts for merit scholarships. The elite Ivy League and some of the almost Ivies don’t offer merit scholarships at all (can be argued that those who are accepted into any Ivy are all likely worthy of merit scholarships) but only need based. So if they aren’t accepting that many students with need they aren’t using much of their large endowments to help poorer students attend. This. A thousand times this. Constant budget cutting by the states mean universities have to cut and raise revenues elsewhere. When California passed the tax increase back in November, it allowed the state to suspend plans to increase tuition by 20% mid-year, but it’s still nowhere near the level of funding the schools used to get. Since 1990, the state’s contribution to the University per student has fallen by over 60 percent. For the first time, in 2011-2012, funds from student tuition and fees exceeded funds to the University from the State. Students who live in dormitories and do not have state identification or a job or bank account in Ohio might not be able to meet this requirement even if they have lived in the state for over a month. Public universities provide letters or utility bills to students to help them meet the residency requirement for voter registration. If the legislation is passed, it would force schools that provide this documentation to charge out-of-state students the same tuition they charge students from Ohio. This change would effectively eliminate out-of-state tuition, which is more expensive than the rates currently charged to students from Ohio. According to the Cincinnati Enquirer, university officials have said they will continue to provide the documentation even if this item remains in the state budget and a group called Innovation Ohio that opposes the legislation has estimated the will cost the schools about $272 million. Voter suppression, it’s what’s for breakfast (lunch and dinner). @KariQ: What I find amazing is that a couple months ago the list of the top 100 Universities came out and 7 (IIRC) of them were California state universities. It’s almost like Californians value higher education or something. @Tony W: Universities don’t pay for summer travel. If faculty members travel abroad they’re paying for it themselves or they’ve wangled a travel grant from some federal agency. If they are traveling on the taxpayer’s dollar, their families aren’t. Re the sports program, you’re right, the expenses are enormous. I don’t know if sports programs pay for themselves or not, but there’s no doubt that athletic departments are way too powerful. And the highest paid official at the university is probably the basketball coach. 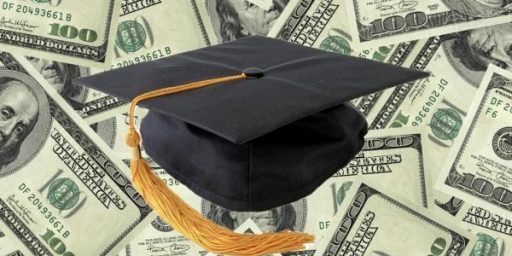 Wait, how did this post, ostensively about rich kids going to famous universities and therefore remaining rich, with no consideration whether their later wealth is derivative of the “education” they receive, the ring-knocker effect, or their environment during development where they were exposed to people with habits that make them wealthy. Then we devolve into a lament over the cost of lesser state universities. With no consideration of whether their “education” was of similar or better value than the famous university, the lower effect of being a ring-knocker from there, or whether there too, a childhood nurture impact is a driving factor. And let’s not ignore the fact rich kids, who go to college or not, have access to familial and network financial and experience resources unavailable to children from lesser means who must apply to the bank and figure out how to form a business from scratch or don’t have a family friend who can put in a good word at corporation xyz. @KariQ: Here are some recent numbers: click. But on the issue of public financing of universities. First, how does the decrease compare to what the budget of the university would be had they not built luxury facilities, expanded into less economically valuable fields, etc. Then you have a real comparison, not that the legislatures have failed to feed the university desire to building palaces on the backs of the people. Especially since for a university to be considered “good” it must by definition exclude the majority of the taxpaying public from its palace. Now, let’s consider the state funding for higher education. What is its purpose? To fund, palaces for the few? To create prestige institutions for state bragging rights? Or perhaps the goal is to provide advanced education to as many citizens as possible? If the latter, then we are at that moment when the legislatures should consider the root purpose, whether increasingly costly universities are the best way to achieve that goal, and how other alternatives might achieve that goal more cost effectively. MOOCs certainly offer higher learning to more people at less cost. Granted there is still much debate on the effectiveness. They admit all but only pass those who can do the work. They do not subject the student to prior selection by possibly biased gatekeepers. The latter was necessary when higher education was a scarce resource but is higher learning a scarce resource now that technology means that the instruction can be recorded once then replayed over and over offering the same experience. It is certainly superior to the prior university scheme to leverage a single instruction, the massive lecture auditorium. @Steven L. Taylor: I have an old friend in the accounting department. He pays the bills and audits credit card statements for this stuff at an actual state school. Many stories of frustration over beers – which I pay for because he makes $28K per year after 12 years there…. It was interesting to see Udacity set their price point for an online Masters in Computer Science this week, at $7K tuition. Sebastian Thun talked about wanting to do it for $1K, but his staff telling him they couldn’t do it that cheaply. I guess that says something about modern, internal, costs structures, before they are even offered to the public. Ah well, as much as I would like my state to spend less on prisons and more on higher education, and especially the educational part of “higher education,” there are many dynamics in place. Given incremental progress, I’d expect the poorer kids to continue their migration towards junior colleges, and I’d hope for better training there for good paying careers. I’d hope that JCs could cobble together good certificate programs from online courses which themselves were drafted at the more prestigious schools. @Tony W: I am not sure that grousing over beers equals systematic evidence. I find this to be a dubious explanation. State funding has fallen or been flat, yes. But federal funding for higher ed has tripled in the last decade to a whopping $30 billion. The student loan biz has exploded with debt quintupling (and that biz involves subsidies, guarantees and the Feds making it impossible to discharge student loans in bankruptcy). Even more, many of the universities own shares in the biggest student loan company out there so they’re making money both ways. I don’t think you can ignore the role the Federal government has played here in 1) creating the dubious goal that everyone should go to college; 2) essentially writing an open check to higher ed. Higher Ed is the next bubble ready to pop. Faculty hires have actually been flat; most universities have been larding up on administration, not teaching. At some point, people can’t keep bankrupting themselves for this. Our family just spent spring break touring colleges in a large city that my daughter might want to apply to. Since I hadn’t been on a college campus in over 30 years I was amazed at the facilities available to the students. I’m sure it’s wonderful to have a full gym complete with climbing wall, lazy river around the pool, bowling alley and any kind of fitness class you desire but how much more is this state of the art fitness center (which was for students, not athletes) costing in tuition? It seemed like the college tours spent more time trying to entice kids with all the goodies they offered and spent hardly any time at all talking about academics. When asked about graduation and employment rates, one of the tour guides told us to just Google them. @Hal 10000: I am not suggesting that this is the only variable. It is, however, rather significant. Yes, as I noted somewhere above, bureaucratic bloat. Yes, there has been a move to nicer facilities. There has also been a need, in the last several decades, to significantly increase technology (which costs money). There are other factors, to be sure. But we cannot pretend like the raise in tuition is not substantially linked to cuts in state funding. I know for a fact it been at my institution. All those buildings and private-planes traveling and visiting professor programs have to be paid for by somebody. Building are expensive, yes. Of course, you do have to put the students somewhere. Not necessarily. Ga. Tech just announced an increase in enrollment in the computer science graduate program alone of 10,000 students, about a 50 percent increase in the university’s overall enrollment. And not one more building is being built. Info. @Donald Sensing: Well, of course. The Harvard report recommends that America follow the model of Northern and Western European countries that have robust apprenticeship and non-degree programs. Some of these countries, like Germany, move students out of degree tracks at a young age, cutting off the prospect of college for many. But other countries, like Finland and Denmark, maintain student choice. Many students opt for vocational training because they aren’t told that college is the only ticket to success. These countries feel no need to pretend that everyone can be a college student, since they have already committed to taking care of both the winners and the losers in society. Nor is it a coincidence that Russia—the country with the highest degree attainment, the country Obama would like us to spend the next ten years chasing after—is also one of the few developed countries with an income disparity comparable to that of the United States. If you want to go way back, it was easier for states to do “per student” funding, when there were fewer students. And of course that can be tied in an unfortunate way to the falling prospects for those higher numbers of graduates. Denmark triumphs again, and seriously a “robust apprenticeship and non-degree program” with student choice would be grand. Of course, we don’t have many “agents” pushing for that in the US. The dynamic has been that liberal arts professors think everyone should get a liberal arts degree. That has been a much stronger voice, again seriously. @john personna: Yes. People with a Ph.D on Liberal Arts have interests in defending these courses, for obvious reasons. And one can argue that university creates, not eliminates inequality, and countries that have policies of increasing the number of college graduates also have high levels of inequality(No rarely, in conjunction with high unemployment). I totally agree that our secondary schools need to get away from promoting college for all. A healthy trade/tech education can provide occupation opportunities for many and without the crushing loan debt that comes with a 4 year degree and a job waiting tables. I think the “everyone in school until you are 18” is a poor model as well. Students who want to attend college should be encouraged but identifying those who don’t andetting them take tech classes or apprenticeships makes more sense than making them take college prep classes. But we cannot pretend like the raise in tuition is not substantially linked to cuts in state funding. I know for a fact it been at my institution. Mine too! We had a 25% cut a couple of years ago (I live in Pennsylvania). The joke is that we’re rapidly changing from a state-supported university to a state-located university. I believe I read at Marginal Revolution that someone went looking for a causal relationship from education to economic growth in developing nations, and that they could not find one. Obviously education is needed, but it is just one leg of the stool. Given a framework of law, a financial network, education can be applied to growth (and creating jobs). But I think that same study implies that “more education” even in a developed nation does not mean more growth. As we are seeing with falling expectations for college graduates in the US. It is a glut, of some kind. That the signaling and networking effects of going to the Harvards and Stanfords of the world are powerful is not only unquestioned but something about which I’ve written numerous times. The point of this post is that, in addition to whatever genetic and environmental advantages rich kids have in getting into said schools–and they’re enormous–they have the additional advantage of being more likely to be accepted than comparable poor kids simply because they can pay. The reason I noted the cost of lesser state universities, specifically, the one from which I ultimately earned my BA and MA, is because I know what it cost to go there in 1986 because, well, I went there in 1986 and paid for it. But I show that the cost is actually pretty much the same as going to the elite state universities. So can adequately funding public education. The Harvard report recommends that America follow the model of Northern and Western European countries that have robust apprenticeship and non-degree programs. Some of these countries, like Germany, move students out of degree tracks at a young age, cutting off the prospect of college for many. That’s not entirely true about Germany–they do test kids (equivalent of American fourth-graders) for admission to Gymnasium (degree-track school), but Germans can still get into university later on. Students who earn high grades in Realschule (non-degree-track school) can move to a degree track and attend university. This gives “late bloomers” a chance. But the larger point is one with which I wholeheartedly agree. There are many jobs, as @john personna points out, that do not require a degree but still have degree holders working. And there are jobs that require a degree but shouldn’t–many IT jobs, for example. I worked with some fantastic network engineers in the USAF who didn’t have so much as an associate’s degree. Those kinds of jobs would be a fine fit for apprenticeships. Back to Germany for a minute: they have several different tracks besides the degree track, and sub-tracks within those. Students split into business-oriented or social-oriented tracks in Realschule and can continue on to apprenticeships or full-fledged business schools from there. The system is really set up to benefit the students, far more so than America where everyone is basically in lock-step from grades 1 through 12. Basically and sadly, “corrections” and “higher education” trade places over time. Still, prior to the 2008 crash, education funding viewed in a “per capita” way, rather than “per student,” was back at in the $7K-$8K band it had enjoyed from over the previous 25 years. Cooper Union is actually going to be charging tuition. Back when I went there, it was a $300 registration fee, and everything else was free. It had been that way for 150 years. But someone made some bad investments with the endowment, and then decided to double down by taking out a loan and making worse investments, and the school — and Peter Cooper’s legacy — is pretty much screwed. I don’t know whether that’s a common problem, but voters here in Washington State recently rejected a referendum that would have allowed our state schools to do the same thing. And the highest paid official at the university is probably the basketball coach. 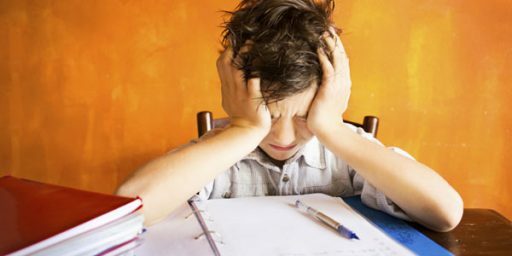 Informative article James, but really, it falls into the category of “what else is new.” That children of the elite attend elite schools and go on to have “success” as defined just about any way you like – has always been true. The only thing that has changed is that much higher tuition costs now are the case at flagship public universities. Obviously education is needed, but it is just one leg of the stool. There are deeper problems there. In some sense, Asian schools are worse than schools in Latin America, but due to cultural differences the Asians have a better educational output. Now, let’s consider the state funding for higher education. What is its purpose? To fund, palaces for the few? To create prestige institutions for state bragging rights? Or perhaps the goal is to provide advanced education to as many citizens as possible? All those and more. In California, the UC system is a major driver of economic growth and technological innovation. They provide valuable technical expertise to our agriculture industry. They train doctors and nurses and advance medical knowledge, improving the health of our residents. The UC system is somewhat restrictive in its admission policies, with admission to those who finish in the top 9% of their class guaranteed. We also have the CSU (California State University) system, which is still a good system of schools, but not the prestige institution that the UCs. Any student who gets a gpa of 3.0 is (typically) guaranteed admission to a CSU. Our state university system is a bargain. We could not get all the advantages that we do from the UC and CSU system in any more cost effective way. No one really wants to cut funding to our universities, we know their value. I almost can’t believe someone who lives in Alexandria, Virginia wrote this post. Your kids can attend NOVA dirt cheap for the first two years of study while living at home and working part time (or even full time) if they choose. It’s convenient — take your pick based on where they live and work. They can attend the Alexandria campus, the Annandale campus, the Loudoun campus, Arlington Center, the Woodbridge campus, or the Manassas campus.. By taking the prescribed courses and earning requisite grades they can parlay those first two years into guaranteed admission to earn their degree at the selective four year Virginia state colleges, including UVA if they are high enough achievers. This is an incredibly convenient, inexpensive route to a high quality education that wasn’t available back in the day when most of us went to college. I attended college on a full scholarship — a caddie scholarship. These scholarships are still out there today (I give generously) for those who want to earn them. But you have to work and work really hard. That’s all for the good. This is a must see on the liberal arts education.. Professor Donald Kagan’s farewell lecture at Yale. He gets going on the current form of liberal education midway through part 3. A telling exposition. BTW, skip to about 7:30 to avoid the interminable introductions. I agree that the German model of apprenticeships, rather than university degrees, for most people is preferable to our system here in the United States. But their system is butressed by a social fabric as well, a social sensibility that we do not have in this country. I have not been there, but people who have tell me that in Germany, if a person rises to, say, the status of Master Carpenter, then that person has as much social status, and as much salary, as an attorney or physician. (Of course, in order to be a Master Carpenter, one must be truly good at it, and be able to train apprentices.) Persons in carpentry, masonry, glass-blowing, and so forth, have far fairer career paths in front of them than in this country. In the United States, a person who “works with his hands” can never attain the social status of the intellectual professions. Hence the crush of people going to college who, quite frankly, are not at all given to intellectual pursuits. Ultimately, the problem may be that we still take our ideas of class consciousness from Great Britain even two hundred years after the colonial period ended. I have not been there, but people who have tell me that in Germany, if a person rises to, say, the status of Master Carpenter, then that person has as much social status, and as much salary, as an attorney or physician. I lived there for seven years and my wife is German (now naturalized American) and I’ve never heard this, but it wouldn’t surprise me. Germans tend to have a higher respect for hands-on trades than Americans do. A great deal of Germany’s national identity comes down to building things with one’s hands. Ultimately, the problem may be that we still take our ideas of class consciousness from Great Britain even two hundred years after the colonial period ended. Perhaps, but here there’s far more class mobility than most Europeans can dream of. An anecdote: about 15 years ago, when I was in the military and stationed at Ft. Bragg, my wife and I attended a military ball. Fancy dress uniforms, toasts to the fallen, dancing, the whole deal. Also in attendance was Guenther Guderian, grandson of renowned German WW2 tank general Heinz Guderian. I thought it would be really cool to introduce my German wife to this guy. She was entirely mortified–he was aristocracy, and she was just the daughter of a bookbinder. I just didn’t understand. The concept of such an aristocracy was alien to my American mind. Sure, here we have celebrity and whatnot, but there are few Americans who wouldn’t snuggle up to a movie star and put on a huge smile for a photo. Apparently Germans aren’t that way. Our state university system is a bargain. I’m a third generation Californian, & a second generation Cal student. The value of our university system is simply beyond measure, both for the state and the country as a whole. Stop for a moment and imagine if Berkeley had never existed. @Let’s Be Free: It’s a pretty good deal but not exactly the same thing. Going JuCo and living at home for two years doesn’t confer the same networking advantages as starting off at UVA. You’re basically skipping the bonding experiences during those formative years. You’d still have many of the other advantages of a UVA degree but it’s not the same. @KariQ: @anjin-san: Some of this is simply an artifact of it being California. That is, it’s a huge, wealthy state, so their flagship schools are naturally going to attract top-flight students. Add in the weather and lifestyle factors and the big California cities can attract the best faculty. Oddly, though, there have been several years of decline as California’s budget crisis impacts the UC system. Right, the financial crisis has hit states, and therefore state universities very hard. That said though, the link above on “State Budgeters’ View of Higher Ed” shows that per-capita funding had been moving in a fairly tight band ($7k-$8k) for the last twenty years. I’d be all for restoring spending to traditional levels, but it doesn’t sound like moving from ~$6K to ~7K, from the per-capita view is going to fix everything from the per-student perspective. I think education’s cost disease owns the declining returns say 1986-2006 with fairly flat investment. If it is networking you are after then go to work for the people that you want to network with. I started with less than nothing. Yet I networked with more notable, well-off, connected people in junior high and high school, getting up at 6:00 am most every summer day and weekends spring and fall to caddie at a country club, than I ever did when I pursued my graduate education at Stanford and hung out with rich kid undergraduates working as a Resident Associate. You are suffering from a lack of creativity and flexibility — college is not everything and it never was. And really, the name of the institution granting the degree is all the networking your kids will ever need if they are at all competent. Get off the label train and onto the work train. @James Joyner: Going JuCo and living at home for two years doesn’t confer the same networking advantages as starting off at UVA. So by this logic, anyone who is not 18 or 19 when they start college should just avoid the whole “college experience” and save a ton of money by looking into non-traditional methods of conferring the knowledge. Plus, if a student’s interest is in studying, i.e., nerdish and not socializing then skip the “college experience” save a ton of money by going to JC or use MOOCs. Better to hook the latter up in a start up or other work hard in a small group and let them learn on their own rather than dumping them in a college social scene for abuse. 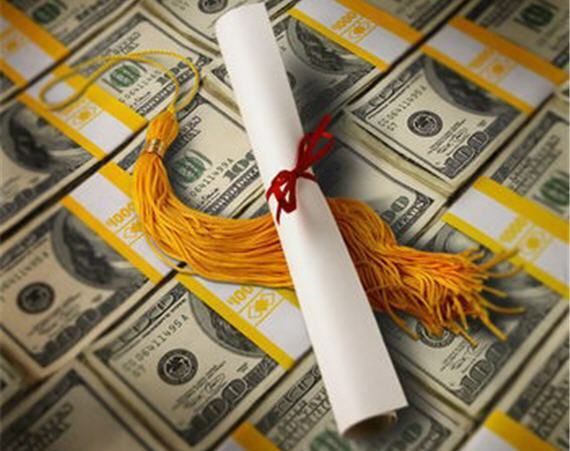 Are For-Profit Colleges Worse than Public Colleges?